In normal outline fonts, as the font is scaled down, the stroke weight also gets smaller, until at some point the characters look almost invisible. Is there a kind of font with fixed stroke width across all sizes, just like when written with a pen, so that the characters are always visible? 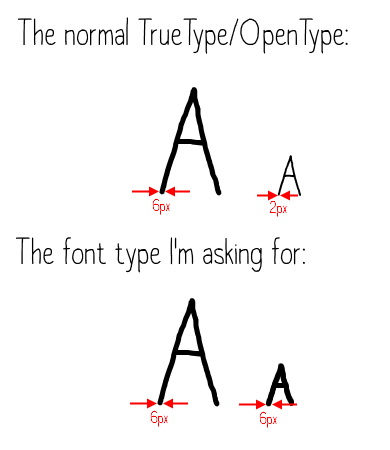 What you want is a variable font, that lets you adjust stroke width smoothly to your font size. Unfortunately, very few are available at the moment. Nick Sherman's v-fonts website has obtained rights to show many of the ones available at the moment. Work Sans, which is fairly monoline and open-source, is likely the closest you can get to what you want. You'd probably need custom code to increase tracking (spacing between glyphs) as text size decreases as well. These are called one stroke, or monoline, fonts. Back in the day these existed, even in corel draw and illustrator*. But they have been since then deprecated because nobody used them. Well not quite nobody, engineers have found some quite good use for them. They shine if you need to laser cut or engrave with a mill. So you can find these in autocad, and other engineering applications by default. Which is why a set of tricks exist like the Hershey text plugin for Inkscape, and monolinetext for illustrator. Personally though i roll my own monoline fonts because then i get what i want that way. Here is the latest one i made about a month ago (it took me about 4 days to do these in a text editor, this one is based one the ASME drafting font spec. I added western european support while i was at it). I still need to implement tracking. * Yes the font engine of 1980's and 1990's was more versatile. What would be the average value of font height vs font width?